Now that I’ve made fresh mango salsa, I had to make myself a tasty taco bowl for dinner. Since I’ve given up dairy, my taco bowls have changed a bit. Gone are the days of cheese and sour cream, and without them a taco bowl can seem a little empty. But with all the colors on this plate, I don’t even notice the cheese being gone. Actually, I far prefer the taste of this vibrant dish! This makes a minimum of 2 taco bowls. Most likely more, depending on your appetite. 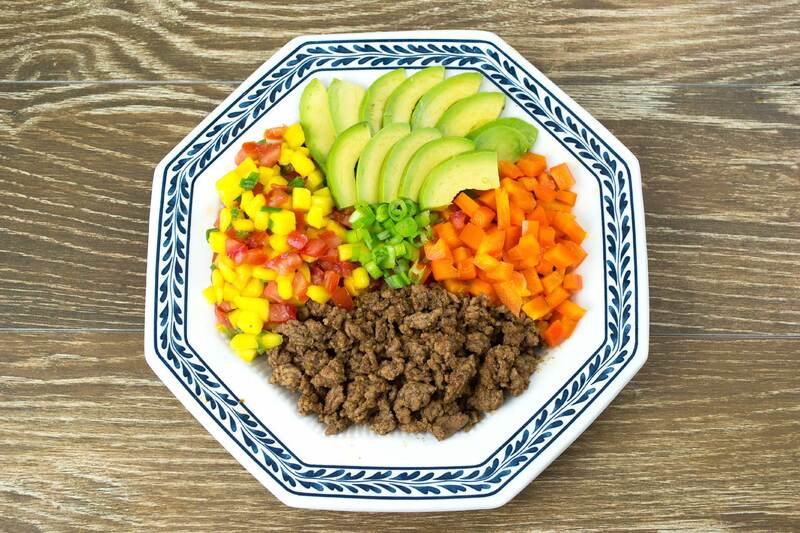 Enjoy the taco bowl recipe – and let me know how it turns out for you! Brown the meat in a covered pan over medium heat. Once brown, drain off the fat into a bowl, reserving a small amount in the pan. Add Mexican seasoning, green onions and broth. Turn up to high and bring to a boil. Once boiling, turn back down to medium and simmer, uncovered, until the liquid has boiled off. Once the meat is done, add a layer of meat to the bowl. Top with mango salsa, chopped bell pepper, sliced avocado and chopped green onions. For a little extra spice, top with a dash or two of hot sauce.